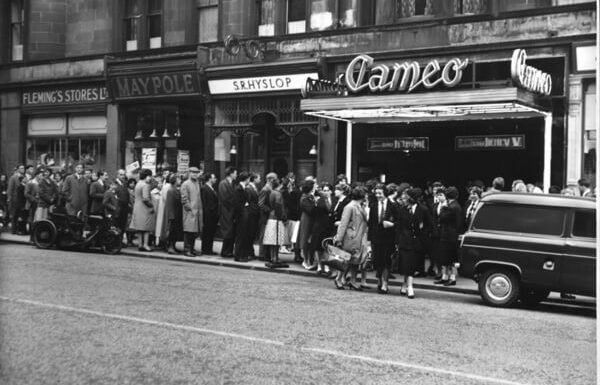 The Cameo is an Edinburgh cinema which started life as the King’s Cinema on 8 January 1914 and is one of the oldest cinemas in Scotland still in use. Since becoming the Cameo in 1949, it has been an independent cinema with a tradition of showing art house films. From 1949 onward it has been an important venue for the Edinburgh International Film Festival. It is at Tollcross, and since 1992 has been a three-screen cinema. The Cameo is currently part of the Picturehouse chain, owned by Cineworld. Behind a modern shopfront, much of the cinema’s original architectural character remains. The entrance lobby has a terrazzo floor and one of the original pair of ticket kiosks. An inner foyer leads to the main cinema built within the ‘back green’ or ‘back court’ (courtyard) of a tenement block. Cinemas were once built like this elsewhere in Scotland, the biggest being the Rosevale in Partick, but the Cameo is the only one still operating. The original screen was mirrored, the first mirrored screen in Scotland, and there were 673 seats in an auditorium showing silent films with orchestral accompaniment, supplied at one time by Madam Egger’s Ladies’ Costume Orchestra. In 1930 the cinema was fitted for sound and could start showing talkies. The space has been left largely unchanged structurally, but the audience now have better sightlines and more comfort with fewer than half the original number of seats. There is an abundance of ornamental plasterwork: columns, cornices, decorative mouldings on walls and ceilings.